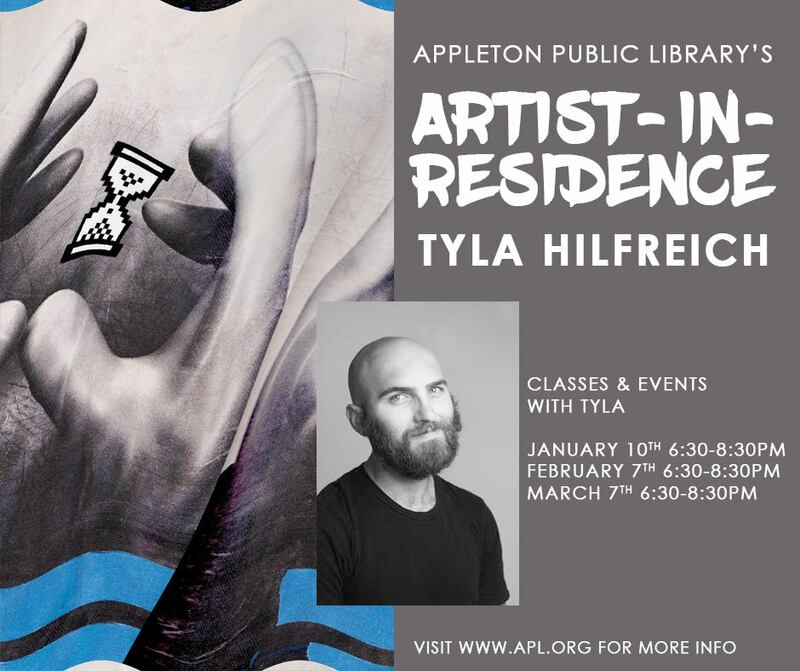 We are excited to announce our next Artist-in-Residence, Tyla Hilfreich! Tyla is an encouraging do-er, with a B.F.A. in Fine Art from the University of Wisconsin-Stout. Before completing his undergraduate, Tyla lived and studied in Hildesheim, Germany. Now in Appleton, he focuses on printmaking, sculpture, collage, sound, writing and collaboration, but dabbles in many many other forms of expression. Apart from art, Tyla’s interests include archeology, language, science, and understanding the human body, mind and spirit. Along with his freelancing career, he takes the time to work with his community as a teacher and artistic mentor to students and professionals throughout Wisconsin. He's organized a handful of art events around Appleton including live printing events, latte art contests, and most recently a community music and art show. In this workshop, we'll focus on color, line, shape, movement and emphasis. Find the balance between smooth/textured, dull/bright, busy/quiet, large/small. You’ll learn the tools you’ll need to find the perfect ying and yang for your work of art. Bring your own t-shirt and use different colors and woodblock prints to create your very own unique, handprinted t-shirt. Choose from over 10 different wood block graphics (created by Hilfreich) to make a unique one-of-a-kind work of art, designed by you! Choose from over 10 different woodblock graphics (created by Hilfreich) to make a unique one-of-a-kind work of art, designed by you! We will bring everything together as we add prints onto our collages from the 1st workshop and previously printed t-shirts. If you missed the previous sessions, don’t worry! Grab any old t-shirt and make it cool again.